Garson, G. D. (2015). Ethnographic Research. Asheboro, NC: Statistical Associates Publishers. A brief graduate-level introduction to ethnography and ethnographic research. Fifty percent more coverage than the 2013 edition. Extensive new section on data gathering strategies. Many more data gathering techniques treated. New FAQs on ethnographic research topics. 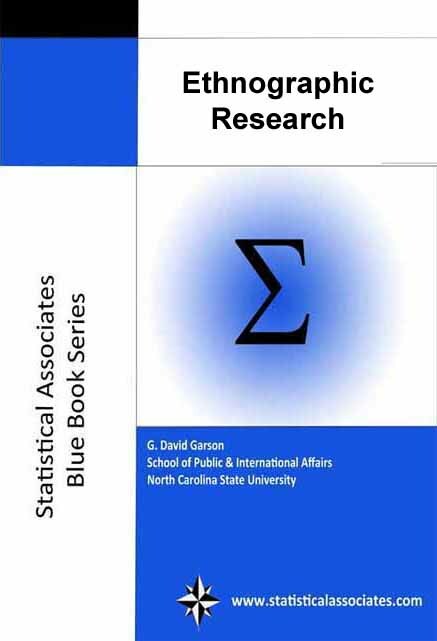 Related information is contained in the Statistical Associates "blue book" volumes on "Grounded Theory," "Nattative Analysis" and "Case Study Research".